Looks all very impressive. The PlanetCute tileset is one of the best I have ever seen. Just a warning: As you see the screenshot I made is within a "temp" folder, and might get deleted whenever the fancy gets me... Maybe you want to link to a copy on your own server? I've been reading your blog for a couple of weeks now, and I think it is fantastic. I'm looking forward to contributing to the prototyping in the future, but for now I'm in the middle of crunch. Thanks a lot for making the beautiful graphics freely available! Ok, but what's with the pic of the piano thing? First, thanks for these tiles and these cute characters - you definitely deserves a big hug from the whole community (and I speak, at least, for the gamedev.net community). I hope that many great guys will use your work to create fun and amazing games. As you know, most of the time, programmers are searching for cool graphics to use in their games - it's so cool to find some great graphics here. Thanks a lot for your work! I've made the first "half-functional" prototype for CuteGod. Here's a screenshot of it, and here's the source code in Python, half-decently documented. 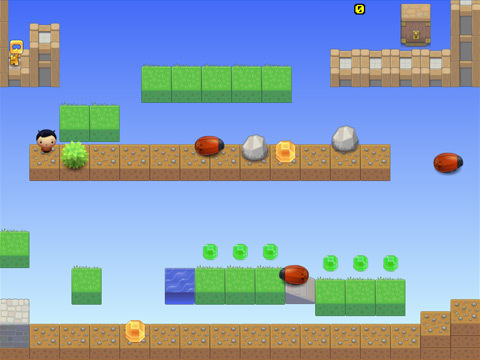 It still lacks the pattern detection so it can be a basic game, but it can be easily implemented this week. I've made a prototype that uses the SpaceCute graphics, but it doesn't use the original design... at all. Check out and let me know what you think. Total hours spent on it is about 13 so far. 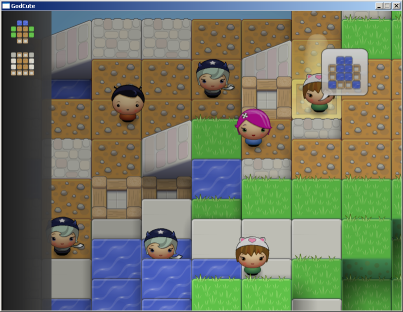 Ramps are added to the world now (which cause a few issues with the selector and with shadows), as are some CutePeons. The CutePeons walk around the map, but the only way for them to go up or down is via ramps, so place your ramps carefully. CutePeons pick a target block that they want to get to, and then find a path to that block. If you pick up the block in front of them, then they'll recalculate the path to their target, which can mean turning around. Likewise, if by moving a block, there is a shorter path from where they are to where they want to get to, they'll take that path. If you want to play cruel God, you can pick up and put down blocks in front of them and watch them walk back and forth - muhahaha. Personally I find it fun to manipulate the terrain so that peons can reach every cell, then watching them for a bit, or being an evil God and making them walk back and forth. I've been working on my game I posted of earlier, the one that was inspired by some of the information in this blog. Well, here's a new test version (may need balancing) with some of the 'Cute graphics incorporated. Balance and suggestion tips are welcome. Kudos on all your projects as well. A little late to the party maybe, but I've been working on a CuteGod prototype as well. I've finally gotten around to packaging something for people to download and mess around with. Feedback is more than welcome (the more the better)! First, sorry for the shameless plug. By the way, I'd like to tell you that I'm building a XNA sprite management tutorial series on my blog (in French, sorry for non-French speakers - although they can still try to babelfish the text), and I'm using your cute tiles and sprites as a resource. here's yet another basic prototype. Shadows coming (tomorrow). Small map, one npc, one pattern. Click the NPC to get the pattern and go nuts. Much more to come so keep watch.. including source code and the caveats/pitfalls a cross-browser DHTML game programmer faces. Just posting to note that I aten't dead, and neither is my prototype. Been busier than expected, but this week I'm taking a break and spending part of that break to work on it. I finally got around to implementing a fairly quick-and-dirty particle system in my engine; this will be awfully useful esp. for billboarding the little people. Right now I'm still at the pick-and-place-tiles stage; I plan to do a couple of refinements to the tile movement (right now they just "pop" to and fro rather than being smoothly drawn up or falling down smoothly) before releasing a first-cut prototype. While I would love to take credit for actively contributing to Lost Garden or in inspiring folks in any fashion, I can't help but wonder when, if ever, I've had a chance to work the PlanetCute graphics or develop a Quarry game. I thank you for thinking of me, Danc, but I hope you can give the proper credit where its due in whomever actually submitted it. While I realize it was in early June you mentioned this, I didn't see it until just recently. Good luck finding him or her!